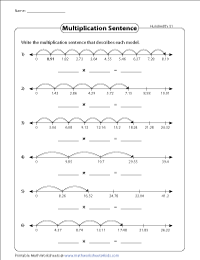 Learn multiplication of decimals up to hundredths place with this ensemble of number line worksheets that are tailor-made for students of Grade 5. The multipliers in this series of worksheets are whole numbers; the multiplicands and product will contain decimals. A number of free worksheets are up for grabs! 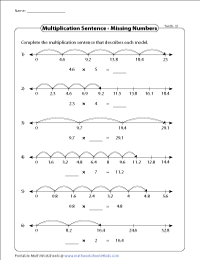 Observe the decimal multiplicands and whole number multipliers given in this set of worksheets. Draw hops on the number line to find the product and complete each multiplication sentence. 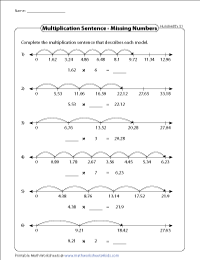 Read each set of multiplicands and the multipliers provided. Indicate hops on the number line to find the product. The intervals, number of hops and end points on the number line indicate multiplicands, multipliers and the product respectively. Find the missing numbers for each multiplication sentence. Observe the number lines. Complete the multiplication sentences by filling in the missing numbers. 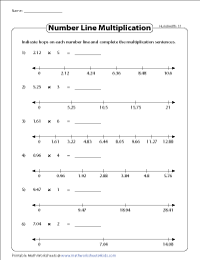 The multiplicands in this series of worksheets comprise decimals in hundredths. 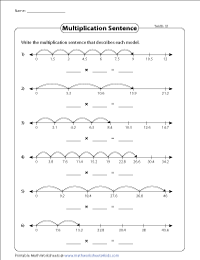 Read and interpret the number line to frame the multiplication equation that best represents the number line. The multiplicands arrived at will be in tenths. 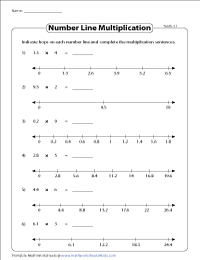 Study the intervals, number of hops and end points on the number line to write the multiplication sentence. Use the answer key to verify your solutions. 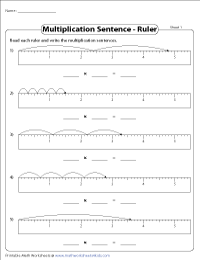 Rulers are used to depict number lines in this collection of decimal worksheets. Observe the markings on each ruler to complete the multiplication equation.